, a new company focused on providing innovative non-electric product solutions for everyday active lifestyles, just introduced a line of portable personal blenders and mixers for people who are on-the-go. No electricity or batteries required. Retailing for $19.99 for the Revablend Stainless Steel Bottle and $15.99 for the Revablend Mixer with Nylon Propeller, RevaBlend features premium food-grade quality stainless steel blades and nylon propeller, a patented system that is connected to the spinning rubber base, which will allow up to 3000 revolutions per minute when rolled along a clean, dry surface at a 30-degree angle. This is the ideal speed for blending fruit smoothies, protein shakes, ice cream shakes, omelets, salad dressings, salsas, meat marinades, and more. Easy to use, fill the lightweight BPA free polypropylene plastic bottle, twist the Revablend wheel by hand a few times to draw the ingredients into the blades, and then roll the rubber base along a surface at a 30-degree angle until the desired consistency is reached. 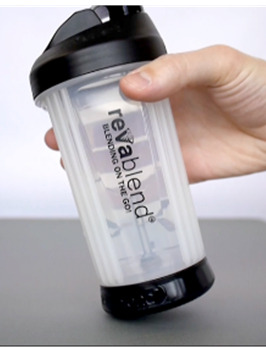 Simple enough for kids to use, Revablend is a great gadget at home or on-the-go for protein shake fans, campers, fitness enthusiasts, healthy eaters, green/eco warriors, tailgaters, travelers, and more. Plus it’s top rack dishwasher safe. ABOUT REVABLEND: Dan Garr, the president and inventor of Revablend, has been inventing toys and products for over 25 years and is also the president of Hot Buttered Elves, a highly creative inventing and toy prototyping company. 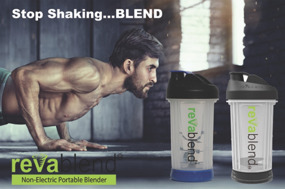 Offering greater mobility and performance without the need for batteries or electricity, RevaBlend is a light-weight, portable blender using a patented gear assembly that allows up to 3000 revolutions per minute.